Royal Enfield dealerships in India have begun accepting bookings for the Himalayan ABS version, CarAndBike can confirm. The adventure motorcycle will be the first model post the newly launched Classic Signals edition in the Royal Enfield line-up to get the safety feature and will sport the same dual-channel unit that debuted on the special edition model yesterday. Dealerships have conveyed a tentative price of ₹ 1.79 lakh (ex-showroom) for the Royal Enfield Himalayan ABS, which will make it about ₹ 10,000-12,000 more expensive than the standard version currently on sale. The Chennai-based bike maker announced the introduction of ABS on its 500 cc models and the Himalayan yesterday. Dealers have also confirmed to CarAndBike that deliveries for the Royal Enfield Himalayan ABS will commence by the first half of September this year. The ABS version will effectively replace the standard version in the manufacturer’s line-up, including the other motorcycles that are soon to get the feature. On the sidelines of the Classic Signals launch yesterday, Royal Enfield President – Rudratej Singh confirmed that all bikes will be upgraded with ABS by the end of this year, much earlier than the deadline of April 2019, set by the government. The Royal Enfield Himalayan’s engine received fuel-injection in 2017 to comply with the BS-IV norms, along with a host of other upgrades to the overall quality, fit and finish of the components. Power comes from the 411 cc long-stroke, air-cooled motor tuned for 24 bhp at 6500 rpm and 32 Nm of peak torque at 4250 rpm. The engine is paired with a 5-speed transmission. 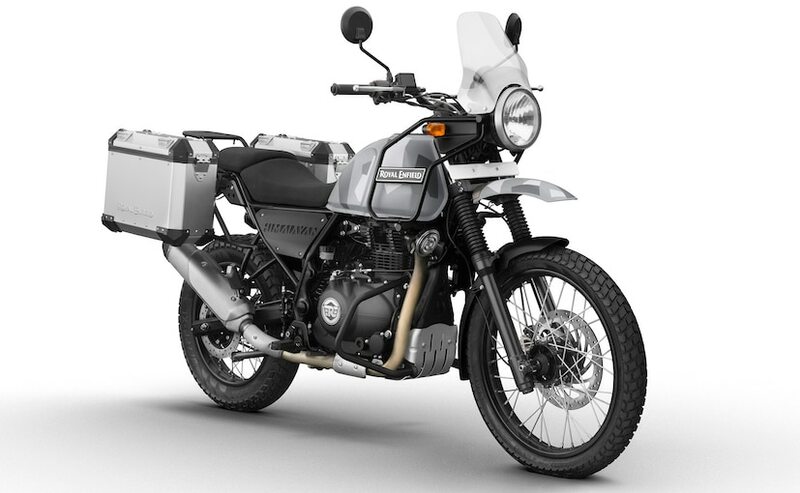 Do not expect the Royal Enfield Himalayan ABS to get any other change, barring the ABS sign on the instrument console. It needs to be seen too if the Himalayan will get a switchable ABS unit, which is otherwise appreciated on ADV bikes. The Himalayan will continue to sport the same black, white and camouflage (Sleet) colour options. Suspension duties are performed by telescopic front forks and a monoshock unit at the rear. Braking performance comes from ByBre-sourced disc brakes at the front and rear. With the introduction of ABS, the 2018 Himalayan’s on-road pricing is expected to pass the ₹ 2 lakh mark, which still makes it a value for money for offering in the entry-level adventure motorcycle segment. The Himalayan’s closest competition remain the Kawasaki Versys-X 300 and the newly launched BMW G 310 GS, both of which sport not only sport ABS but better performance too.